Ottawa-Glandorf’s Taylor Alt hits a spike agains Pemberville Eastwood’s Ashley Hodulik, left, and Alissa Ray during a Tuesday night Division III district semifinal at Kalida High School. See more volleyball photos at LimaScores.com. Ottawa-Glandorf’s Erica Annesser digs the ball against Pemberville during Tuesday’s Division III District Semifinal tournament at Kalida High School. 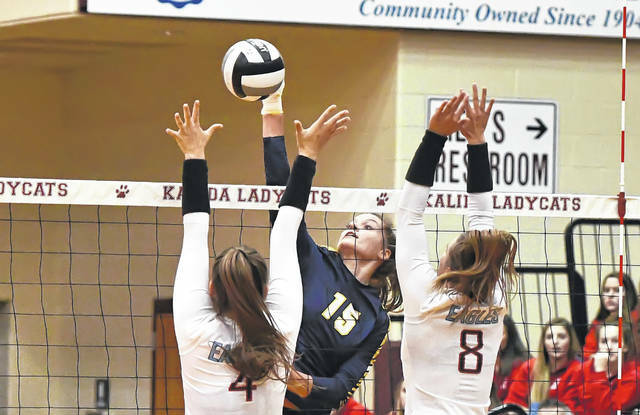 KALIDA — The top-ranked Ottawa-Glandorf volleyball team Tuesday night lived up to its number-one ranking in Division III. The Titans took on Pemberville Eastwood in a district semifinal at Kalida High School. The Titans secured a 26-24, 25-22, 25-14 sweep. The Titans (24-1) advanced to take on the second-match winner between Coldwater and Liberty-Benton at 6 p.m. Thursday back at Kalida. Eagles’ head coach Jeff Beck felt his team stayed with the number-one team in the state for the first two sets. With the likes of Western Buckeye League Player of the Year Taylor Alt (13 kills) and Erica Annesser (14 kills, 14 digs) leading the way from the start for the Titans, with Eastwood being paced by Kyra Contris (8 kills, 5 aces) and Alyssa Ray (5 kills, 2 block/stuffs), the battle was joined the first set. O-G had the biggest lead of 4-0 and then after Eastwood came back to take a 6-4 lead, the set tightened up the rest of the way. It came down to the closing burst which went the way of the Titans. After a Contris ace tied it at 24, a tip by Alt and a hit off the block by Alt gave the first set to the Titans. The second set was very much like the opener. With the biggest lead by either team being four – at 12-8 by O-G – the Titan defense began to come into play more and more behind the likes of libero Claire Eiden (18 digs). In the end, Ottawa-Glandorf was just a little more consistent overall. At 22-22 on a serving error by Eastwood, Alt put one down off the block and then a pair of hitting errors – the first set up by a block from Alt - put the Titans in firm control up two sets to one. On the other hand, Beck felt that his squad couldn’t recover from the disappointment of losing the first two sets. O-G started out quickly in the third set, building a 5-0 lead, culminated by an ace from Alt. Eastwood came back with within 6-5 on an ace by Bailey Ramlow but O-G began to assert its control. 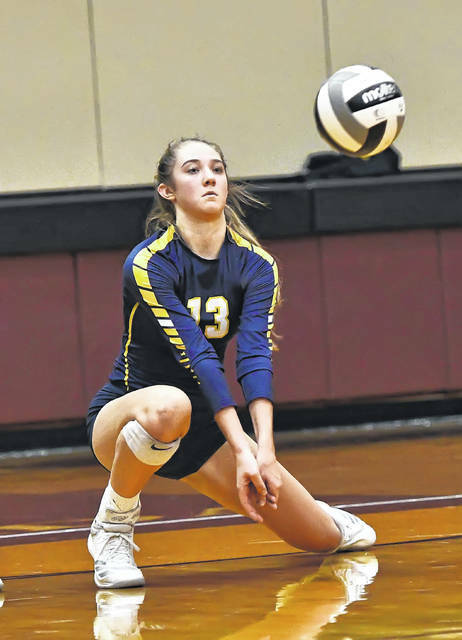 With setter Brianna Schimmoeller (18 assists) guiding the way, O-G began to build its lead and used a 7-0 spurt later in the set – behind the serving of Schimmoeller and a pair of stuffs by Maddie White, to put themselves in position for the win. A serving error by Eastwood gave the final serve to OG and a hit off the defense by Kasey Ellerbrock finished off the sweep. Liberty-Benton won 25-19, 25-21, 19-25, 25-18. Annelise Harlamert had 41 assists, Lauren Gilliand had 13 kills, 15 digs and five aces and Katie Alig had 13 kills and 15 digs for Coldwater (18-7). This entry was tagged coldwater, ottawaglandorf. Bookmark the permalink.